Diaries of The Breadman’s Daughter: The Escape Artists. 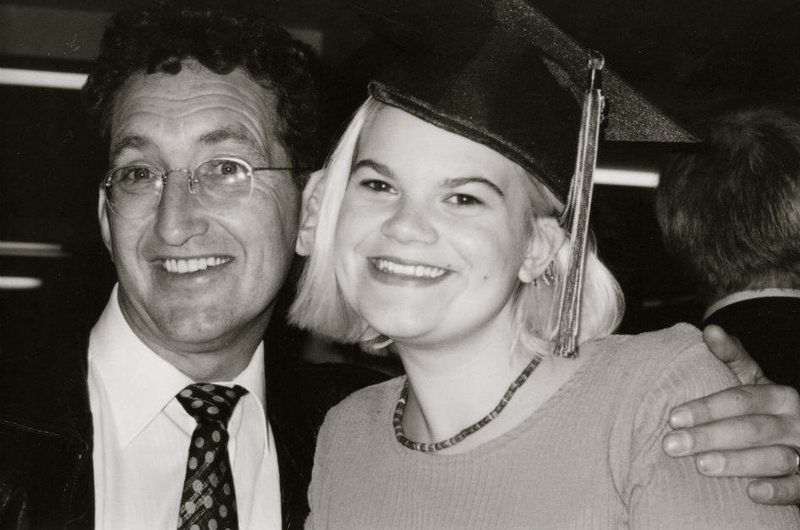 A and E grinning from ear to ear at her high school graduation. Sometimes I just want to escape. Get away from it all. Take off. Break out. I have fantasies about this. They usually go something like this. I’m in the truck, or some other vehicle with an automatic transmission, heading towards work or some other obligatory destination. I come to a traffic light. It’s red. I stop. That’s when it happens. Instead of waiting for the light to turn green so I can follow the prescribed relentless path. Otherwise known as my daily routine. I hang a right on the red and keep on going. To where, I don’t know. My only thought is, I’ll know when I get there. I briefly consider my family, and those I love. The ones who clutch and cling and cleave to my hungry heart. I shake those distracting binding thoughts from my head. Toss the rattling chains to the curb. I hammer on the gas pedal. Accelerate. Take a deep breath. Off I go. A free bird. Untethered. This daydream of breaking free had exponentially grown since E received his diagnosis back in December. Like everything else that had happened since then, I wasn’t the only one looking for some escape hatch. A magical rabbit hole to dive into. E too was looking for a way out. Even if just for a little while. A small respite away from the all-consuming Big C was all we both needed. So in the middle of February, E and I left town. Split. Vamoosed. Set sail. The truth is, we didn’t go far and our little escapade had an underlying medical purpose. But for two full days we were in a cancer-free zone. On Monday, February 18 E was booked into the Cancer Agency in Vancouver for a PET scan. This is one big mother of a test. Head to toe 3D color imaging. Nothing can hide from its radiating nuclear eyes. If cancer is there, the PET will reveal it. That was Monday. Before that we had two glorious days of fun and play in Vancouver. Our oldest daughter A lives there so accommodations were taken care of. What we didn’t expect was the pampering she provided. We were eternally grateful. She gave us exactly what the medical profession couldn’t. Love. In massive doses. Saturday night was a “date night” orchestrated by this wonderful girl of ours. We hadn’t had one of those in ages. If ever. E and I didn’t really date. Everything we did was kind of topsy turvy, upside down and backwards. We met in a country bar, fell in love, found our groove, had our youngest daughter and got on with day-to-day life. Everywhere we went that weekend, we were enveloped by such grace and love. We had many close encounters of the angelic kind. Starting with The Fish Shack. Being both popular and trendy, it was crowded. Filled to the rafters. No room at the shack for us. Despite the generous gift certificate from our daughter, we weren’t up to standing in line and waiting to have dinner, no matter how good the food. But before we could even consider hightailing it out of there, the young restaurant host had a table set up just for us. Once settled into our cozy table for two, we were greeted by our waiter who was gracious, witty and downright entertaining. The food was great, but he made the experience extraordinary. We felt like royalty. After dinner we strolled arm-in-arm up the street to the Vogue Theatre, where our daughter was working. She had seats for the early show waiting for us. It was improv night with Colin Mochrie and TheatreSports. This was a new experience for both of us. We’ve been to scads of music concerts and festivals over the years but we were Live Improv Comedy virgins. They say laughter is the best medicine. On that particular Saturday night in Vancouver, this cliche proved to be true. We laughed ourselves well that night. Not physically. E still had cancer. It wasn’t a night for those kinds of miracles. Seas didn’t part. Water didn’t become wine. Yet supernatural things occurred. Spiritual healing took place. It was a night of joy. Merriment. Glee. Our spirits were uplifted. Our hearts lightened. Worries held at bay. We were just us. Not the guy with cancer and his wife. On Sunday we hung out with our daughter. She cooked homey comforting food for us. It was like being back at 204 in Ma’s kitchen. Brunch and Sunday night dinner. Sandwiched in between was a trip to Ikea. We returned to the apartment with shelving, a hanging lamp and other Ikea accoutrements. I languished on the sofa like the Queen of Denial while E and A assembled everything with the infamous Ikea allen key. I treasure the memory of that evening. Just the three of us. It’s funny how you can shut things out when you need to. For those 48 hours, E and I were free. Unencumbered. Immune. Safe. The untouchables. Monday would come soon enough. As I breathed in the delicious aroma of beef stew simmering on the stove, I thought how wonderful it was that we were here in this place, at this time, with each other. This made me happy. ← Diaries of The Breadman’s Daughter: Today.